At Your Dressmaker, we strive to offer our customers the finest selection of period clothing and accessories at affordable prices. While most of our items are handmade and created when we receive an order, from time to time we offer special merchandise in limited sizes, colors, and quantities. 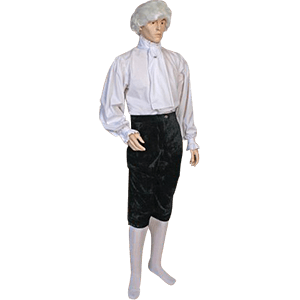 In our Deals section, you will find garments and accessories catered to popular historical periods such as the Medieval, Renaissance, Scottish, and Victorian eras. We often discover merchandise most suited for steampunk and gothic genres as well. Gowns, jackets, skirts, pants, and cloaks from every era, age group, and gender appear in this section. We also feature discounted accessories from our leather goods such as shoulder bags, belt pouches, and decorative buckle belts. Markdown items from our headwear, footwear, arm bracer, and jewelry sections are included too. At Your Dressmaker, we are always in pursuit of special offers and discounts for our fellow role players. We suggest that you keep a careful eye on our ever-changing sales section. 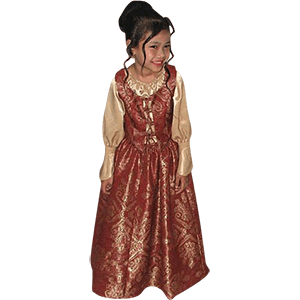 It is certain you will find garments and accessories suitable for your historical wardrobe, while taking advantage of the amazing savings these deals provide. When visiting Your Dressmaker, do not forget to check this section from time to time. We offer special sales and discounts in womens historical clothing. 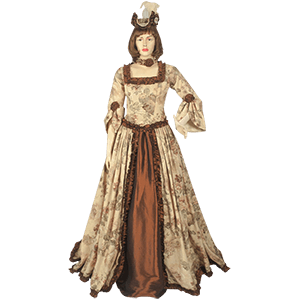 Whether you are on the lookout for a fashionable renaissance gown, or a ritual robe for a Celtic or medieval ceremony, we are certain you will find something useful in this ever-changing section. The deals found here include period gowns, dresses, petticoats, cloaks, robes, and more in limited quantities, colors, and sizes. You will find special markdowns in medieval, renaissance, steampunk, gothic, Scottish, Celtic, and Victorian apparel. You may find a Scottish tartan dress at an amazing price. Maybe you will discover a luxurious hooded cloak that captures your fancy. You might even find that beautiful ball gown that you have been seeking. At Your Dressmaker, not only are we committed to creating the highest quality historical gowns and period apparel, we seek to bring you the best prices. So, keep a good eye on our discounts and deals section. Perhaps you will find that special item that will increase the authenticity and esteem of your historical role. Not only will you love the handmade garments that we create, you will be delighted by the savings we provide as well.